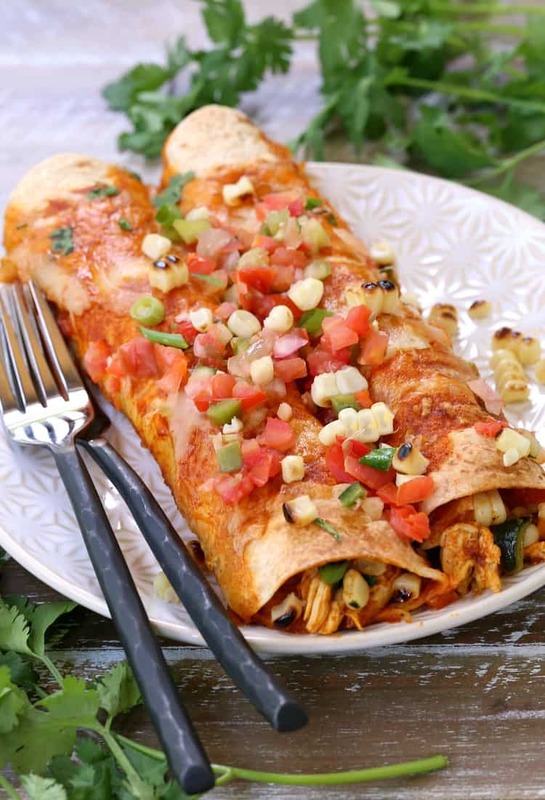 Make these Charred Corn Chicken and Poblano Enchiladas with your favorite farm stand produce! 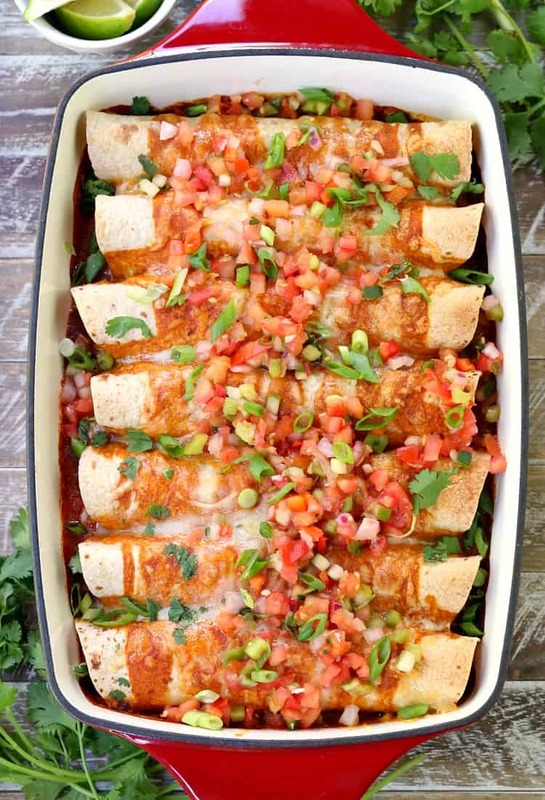 These enchiladas are sure to become a staple at your house! So here we are at the tail end of summer trying to hang on to every last bit of it. 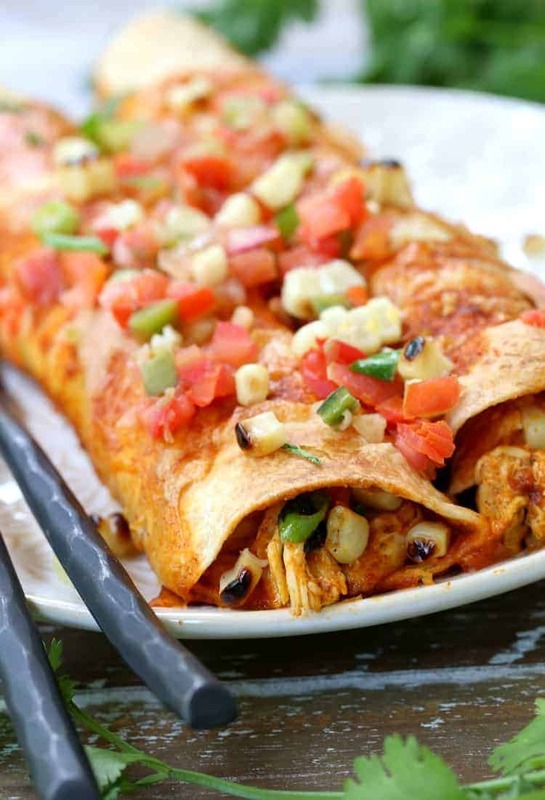 One of the things we do to hang on is to make dinners like these Charred Corn Chicken and Poblano Enchiladas made with our favorite Mission Organics® Whole Wheat Tortillas! I’m lucky to live where I do, I get to experience all the seasons – some I like more than others…but I think it makes you appreciate things more. 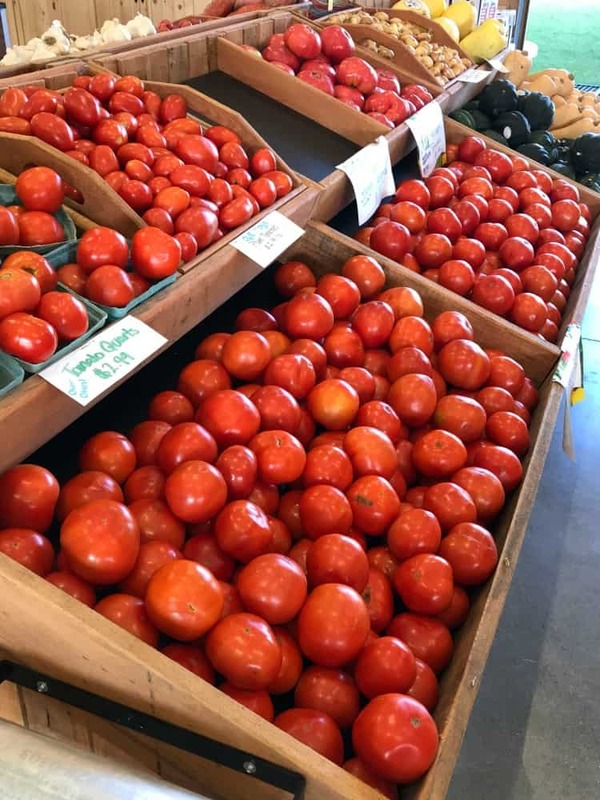 For us the warmer weather means lots of trips to our local farm stand. We have a lot actually around where we live but the one that we go to the most is only a few minutes from our house. 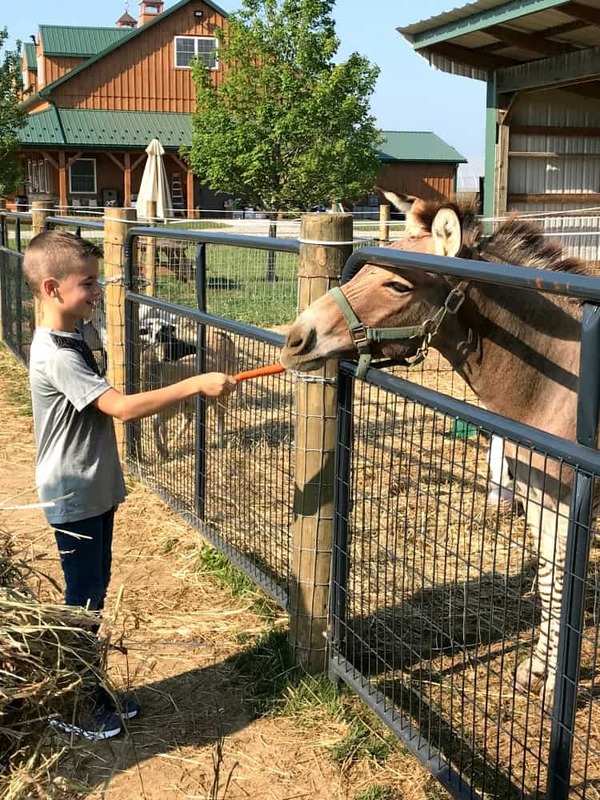 They have animals there to look at (and feed) and lots of events and activities year round but most importantly, they have tons of fresh vegetables. Apparently the zonkies are big fans of vegetables too! Sometimes we just head out and see what looks good, then we base our whole dinner around it. We make it into a game and usually the first one that comes up with a recipe that night wins. What’s most important is getting the freshest ingredients available. Like I said, we live in an area where we have all the seasons, so in the winter it’s pretty much whatever is at the grocery stores. So in spring, summer and fall we stock up on everything we can, make lots of delicious food and freeze it for winter if we have to. Dinners like these Charred Corn Chicken and Poblano Enchiladas made with Mission Organics Whole Wheat Tortillas are always on the list! Because these tortillas are USDA organic certified and non-GMO product verified…they’re going to be the perfect match for all our fresh ingredients. 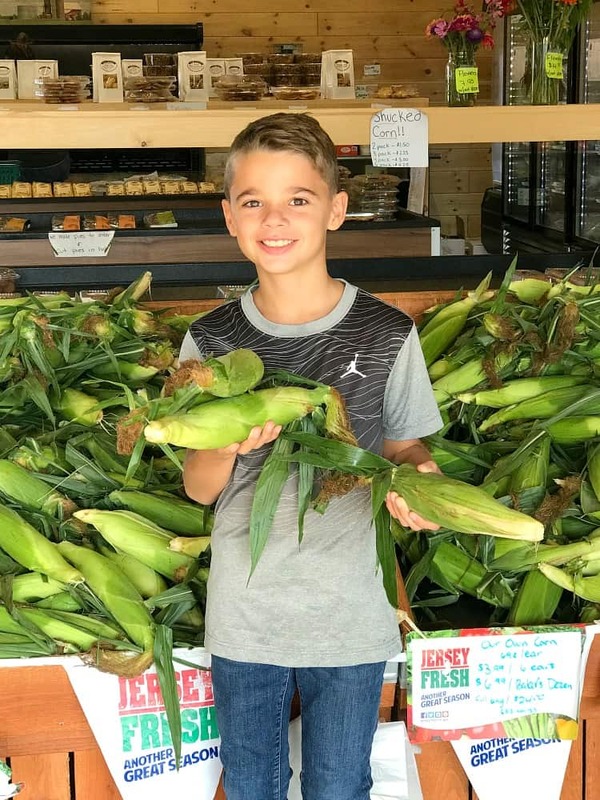 This time at the farm stand I let my youngest son just go – told him to pick whatever he saw that he liked and come up with something to make with it. First, he grabbed fresh corn. And then a whole bunch of tomatoes and peppers. All things he loves – but besides a salad – he was having a hard time coming up with something to make. Enchiladas would be great, I said. Hoping he’d take the bait. He did, since he was excited to go and see the animals too, so we stocked up and off we went. 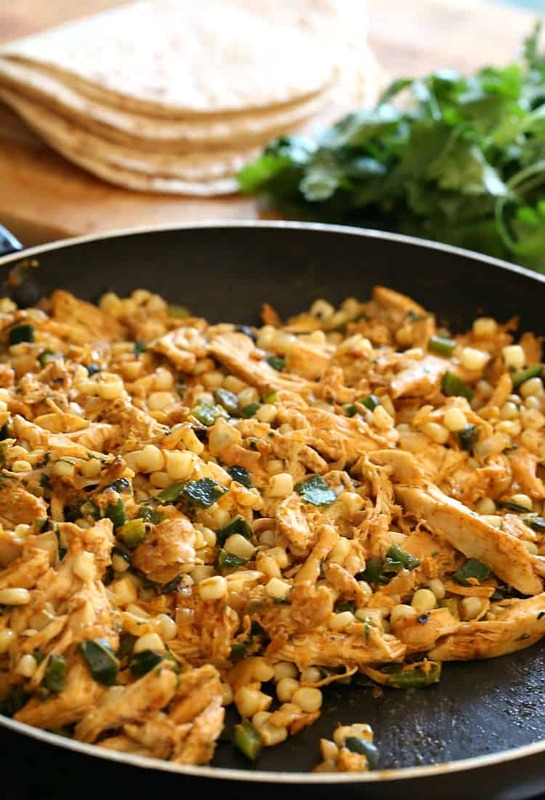 These Charred Corn Chicken and Poblano Enchiladas were going to go perfectly with our favorite tortilla by Mission Organics. 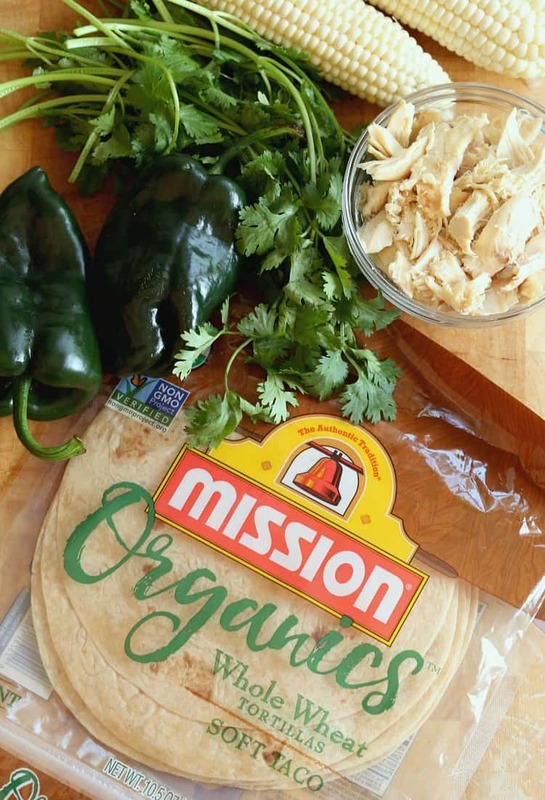 Our kids actually prefer whole wheat products like these Mission Organics Whole Wheat Tortillas. 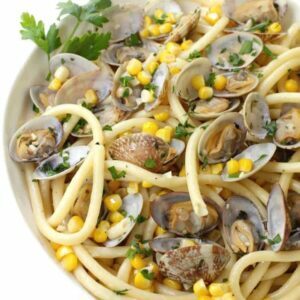 Most kids only like the white stuff but for them it’s all about the nutty, fresh flavor that whole wheat brings to the dish, especially when the product is as good as this one. 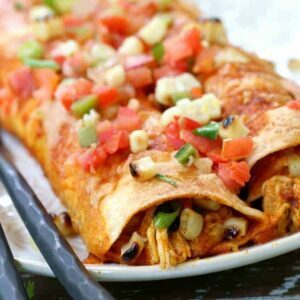 Since there are a few steps to making these enchiladas, I grabbed a rotisserie chicken from the store and used it for the filling. The fresh charred corn and poblano peppers stuffed into these tortillas is what this recipe is all about so don’t feel bad taking a short cut. I like to char the corn right on the grill, husks and all. No need to pull back the silk – just throw them on. After about 15- 20 minutes they’ll be sweeter than any corn you’ve ever tasted. WAY better than boiling corn in my opinion. Once you have your corn and peppers ready you can make the filling. Just add some onion and garlic to a large skillet, cook them down a little, then get the corn and peppers in there. Add your chicken, enchilada sauce, cream cheese and some seasonings and the filling is done. Now it’s time for the tortillas – you’re going to need two packages for this recipe. We like to make good food in large quantities – not only because our boys eat a lot but because these are perfect for freezing. Then you can break them out in the dead of winter and have yourself a party. Add about 1/4 cup of the filling to each Mission Organics Whole Wheat Tortilla and wrap it up. Place it into a baking dish with some sauce on the bottom and keep wrapping until the filling is gone. If you don’t have a baking dish large enough for all the enchiladas just grab another and load the rest in. You can freeze one and bake one – or cook it all and hope for leftovers if you live at my house. Cover these Charred Corn Chicken and Poblano Enchiladas with more sauce and cheese and get them in the oven. Since the filling is already cooked, you just need to heat these up a little, melt the cheese and toast the tortillas to bring out the flavor. Seriously, who is going to turn these enchiladas down? Talk about a great way to sneak some more vegetables into dinner too! I can pretty much put anything in between some tortillas with cheese and my boys are going to eat it. 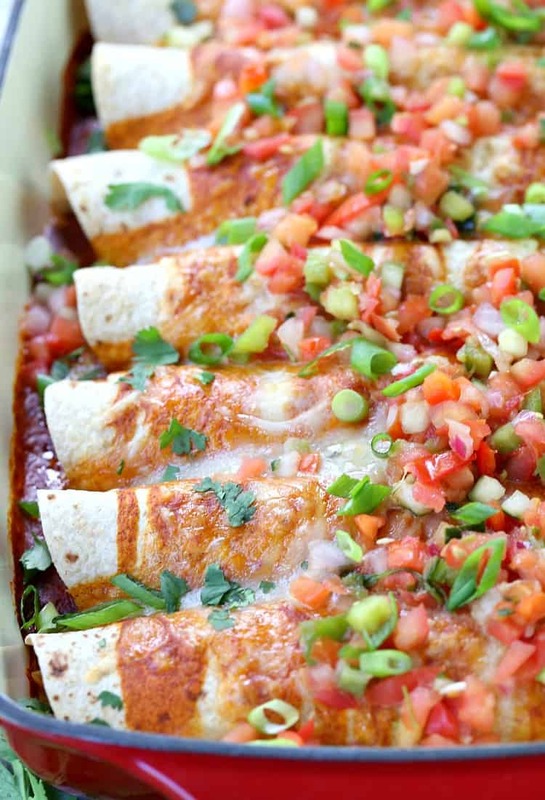 Just look at those toasty edges on these enchiladas! 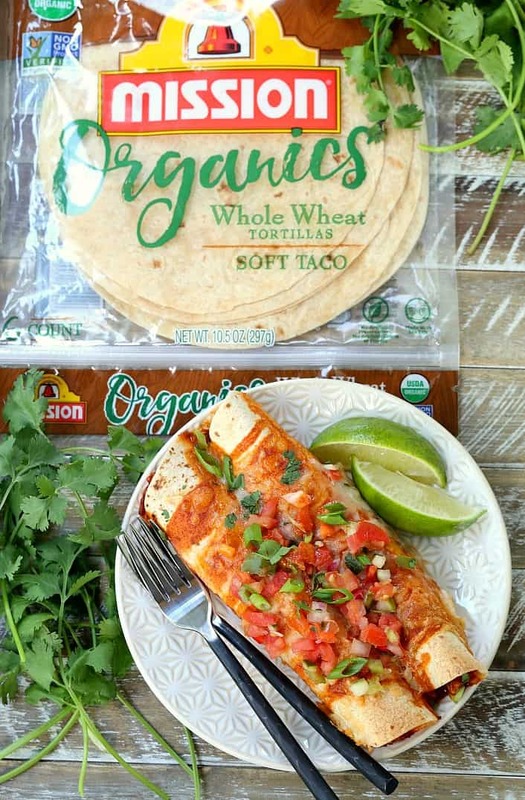 Mission Organics Whole Wheat Tortillas don’t have any artificial colors, preservatives or flavors so all that right there is just the natural tortilla. No wimpy tortilla is going to keep all that delicious, fresh filling inside. 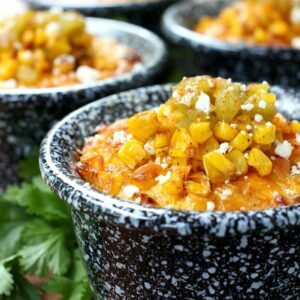 The last thing to do is to add a fresh pico de gallo on top (you can make your own or use a fresh, store bought brand) and lastly the charred corn from the grill. I know you guys are going to love these, they’re not too spicy at all so I’d say they are kid friendly for sure. And if you haven’t tried Mission Organics Whole Wheat Tortillas get on out to the store and grab some! They are found nationwide and you can find them right in the tortilla section of your store, which at my store is right next to the produce. Click here to find a store locator and more recipes! That’s if I haven’t beat you there and grabbed them all for myself! Preheat the grill over medium heat, about 400 degrees. 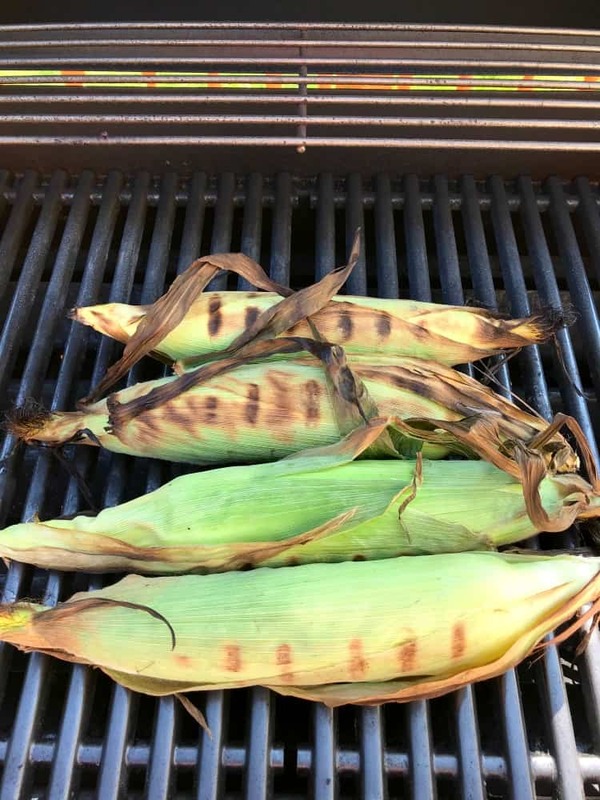 Place the corn on the grill and cook, turning every few minutes, until the corn is charred and semi-cooked through but still crisp, about 15 minutes. Add the poblano peppers the last few minutes of cooking time to char them at the same time as the corn. Remove the corn and peppers from the grill and set aside to cool. 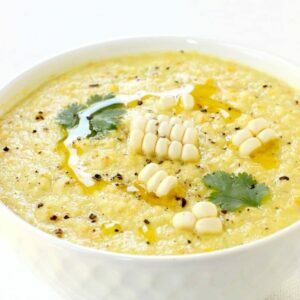 once the corn has cooled, remove the husks and silk and cut the kernels from the cob. Remove the seeds from the peppers and dice, leaving the skins on. Start the filling by adding the olive oil to a large skillet. Stir in the garlic, peppers, half of the corn (the other half will go on top of the cooked enchiladas), salt, black pepper and cumin and cook for another 3-4 minutes. Add the shredded chicken, cream cheese, cilantro and 1/2 cup of the enchilada sauce. Stir to combine and melt the cream cheese into the filling. Turn off the heat and set the filling aside to cool. Pour another 1/2 cup of the enchilada sauce in the bottom of a baking dish. If you are using 2 baking dishes you might use a little more, just make sure the bottom of the dish is covered with the sauce. Place a tortilla on a board. Add about 1/4 cup of the filling to the tortilla spread out in a line across the tortilla then roll up ending with the seam side down. Place the enchilada in the baking dish and repeat with the remaining tortillas until the filling is gone. You should end up with about 12 total. 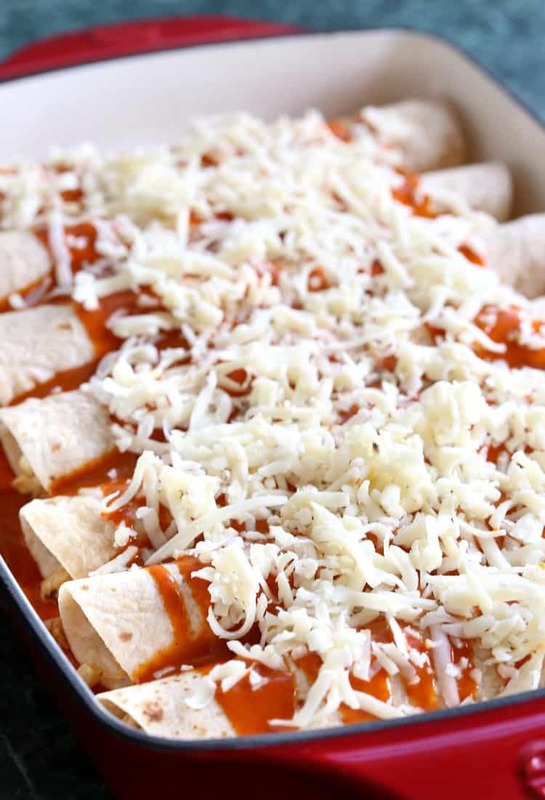 Pour the remaining cup of enchilada sauce over the tops of the filled tortillas then cover with the cheese. Bake in the oven for 20 minutes until the filling is hot and the tortillas are slightly browned and toasted. Sprinkle the remaining charred corn and pico de gallo on top of the enchiladas and serve.